Well of course her front yard is a vineyard! We were pulling off a bucolic road to meet Kerith Overstreet and her husband Brian who had invited us to dinner at their Healdsburg home. Months earlier, Kerith had visited Vintology to introduce New York to her label Bruliam Wines, and upon learning of my upcoming visit to Sonoma kindly extended a dinner invitation to her home. I suppose I shouldn’t have been surprised that now, the driveway gate opened to reveal green rows of grapevines. We walked the property and Kerith led us through their garden, bearing citrus trees and multiple varieties of tomatoes. I can scientifically conclude that a ripe cherry tomato, plucked and popped directly into the mouth, pairs perfectly with Sonoma County rosé. Their garden’s abundance was overwhelming to us New Yorkers, whose sense of agriculture is bound to Whole Foods and the Costco produce department! Our heads nearly blew off, observing such bountiful home grown farming, no further than one’s front door. The tour finale: the ‘front yard’ vineyard. I quickly learned this was Torrey Hill Vineyard, Bruliam Wines’ sole estate vineyard. 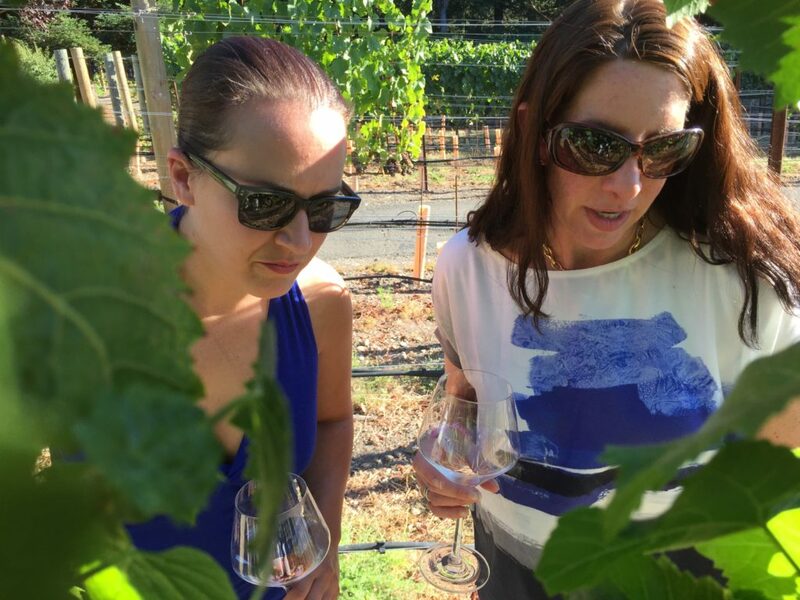 When Kerith graduated from University of California, Davis in 2008 and established Bruliam Wines, her aim was to cherry pick and buy fruit from top Sonoma County sites to produce single vineyard wines. She’s charmed and sometimes bribed (with baked goods) her way into procuring some of the most sought after fruit from top growers. Torrey Hill Vineyard, however, is all hers! Kerith and Brian bought the house and vineyard in 2012, but Torrey Hill Vineyard has a long history, likely planted in the 1960s and previously named Two Sisters Vineyard. The name “Torrey” is personal to Kerith and Brian. It refers both to a tree found in Brian and Kerith’s hometown of La Jolla, and to the mascot of their high school where they met in the 10th grade. This vineyard makes Bruliam a true family undertaking… the Overstreet children even draw an original annual label for the Torrey Hill Pinot Noir bottle. With her UC Davis degree in Viticulture and Enology, Torrey Hill is Kerith’s continuing education. 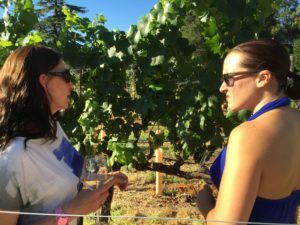 As we walked the rows, Kerith discussed how living on the same site as a vineyard and seeing it everyday has given her a more intimate understanding of viticulture. Torrey Hill is a manageable vineyard at just under an acre, and she’s been able to observe canopy management, annual pruning, vine training and even damage and vine mortality. Tasting her wines, she’s been able to connect the decades of maturity in these grapevines with the finesse and nuance in her final bottles. 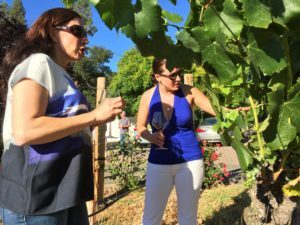 As we walked out of the vineyard, Kerith shared that Torrey Hill also makes her a more educated purchaser of the grapes she procures from other sites. Dinner time! Brian and Kerith announced the menu, grilled steak tips with vegetables and a tomato flatbread from their garden, and red wines crafted by Kerith. Now, we’ve all done the locavore movement. My stint at Blue Hill at Stone Barns means I’ve seen plenty farm to table. But this meal was more… we’d enjoy the full culinary, gardening, vine growing and wine making talents of the Overstreets. This wasn’t farm to table… this was soul to table. The tomato flatbread paired perfectly with a 2014 Sangiacomo Vineyard Pinot Noir. This Pinot, both savory and fruity, is the result of Kerith’s relentlessness. She’d first tasted a Pinot from a Sangiacomo site a few years ago, the Sangiacomos being a prominent third generation grape growing family. It would take two years after her first email request to Mike Sangiacomo, but she’d ultimately get to procure this fruit. The palate revealed how this cool, foggy site ripens Pinot Noir very slowly and perfectly. To buddy up with the steak, a 2013 Rocky Ridge Vineyard Zinfandel. In the warmth of the July night, this Zinfandel was still so refreshing, with a core of acidity and plum and spice. The tannins were soft and age-worthy… I can picture somebody popping this same bottle on another warm evening, one decade later, and being perfectly happy! As the sun started to fall, the conversation inevitably headed towards politics. 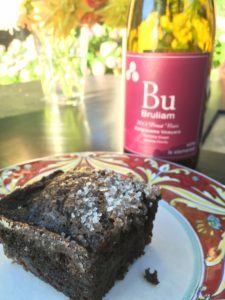 My personal politically ideology is pro-dessert, so I stayed focused on a surprising chocolate zucchini cake, dusted with rocky sea-salt. It’s apparently a healthy hit with the Overstreet children. Sadly, I emailed Kerith for the recipe and attempted it myself last night… I can best describe the result as something of a disaster and proof that I should stick to pouring wine. A Meyer Family Cellars Port accompanied dessert. A babysitter bailout prevented Karen and Matt Meyer, Kerith’s good friends and winemakers in their own rights, from joining us for dinner. Their port was their stand in. Matt and Karen both came to wine through different paths, he through California and UC Davis and she through Australia and Charles Stuart University. They met while working the crush at Argyle Winery in Willamette Valley and later formed Meyer Family Cellars. This bottle, a 1987 modified solera of zinfandel port wine, was an awesome way to slip into the lazy final leg of a dinner party, with warm flavors of baking spices and darker fruits. 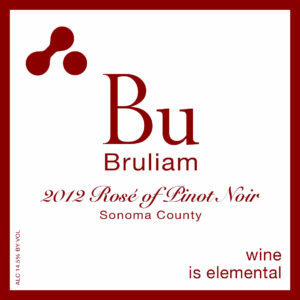 Now back at Vintology, I look at the Bruliam Wines 2012 Gap’s Crown Vineyard Pinot Noir sitting on the shelf and think of this soul to table evening. It’ll be hard to recreate… but perhaps if I bring Gap’s Crown home and convince Kerith to ship me some tomatoes! A very special thank you to Kerith and Brian Overstreet. Previous Previous post: Who’s the Greenest of Them All? Oregon!